The Kettlebell Press is one of the best exercises you can do for well defined, strong and mobile shoulders. Unfortunately the kettlebell press can also be cause for a host of shoulder problems. When it comes to injury I believe there are two main reasons as I spoke about in my article here “There are two main reasons someone gets injured, the first is that the trainer is a cowboy and has no idea what they’re doing or it’s the opposite and the participant does not listen to the qualified trainer.”. What is using common sense? Common sense is having a good sense and sound judgement in practical matters. Huh, I hear you say! I agree, but you’ll still see some too proud newbies going for that heavy weight and get it above their head whether it’s going to cost their shoulders or not. You’ll still see someone performing a complicated move that takes months to progress to. They’re not using their common sense and did not check their ego at the door. Progression is taking it step by step, breaking complicated presses down into the most basic variation and slowly over time start adding to it. Checking your ego at the door means that you think about your body and safety first, not the amount of reps or weight you can press. Regression is where you or your trainer made a wrong calculation on weight, reps or technique you can perform without issues, and you then regress to a lower weight, less reps or easier version of the exercise. A good example is the kettlebell side press, an easier version and good regression to this is the bent side press and then the hybrid press. We’ve covered things about the kettlebell press in extremely fine details like racking, tension, breathing, progression, overhead lock-out and even the drop. 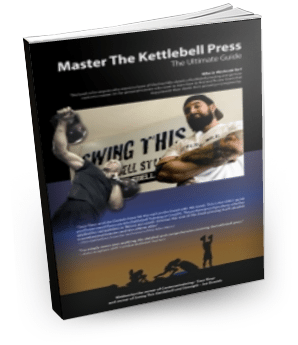 If you’re into pressing, wanting to get into pressing, looking for variations to add to your own training or group classes then this is the book you want to get for yourself. Check out our facebook page dedicated to the kettlebell press and join in with the others, submit photos and videos of you or your clients kettlebell pressing and share information on the kettlebell press. You can buy the ebook in our Cavemantraining shop, the kindle or print version can be purchased on Amazon. If you want to be in the running to get the book for free, add yourself on the list here and every month we’ll draw a lucky winner from the whole list who will receive the book for free. Your thoughts here or below.